Welcome to the heart of my home, also the room currently tied for first place (with the laundry room) in my home. 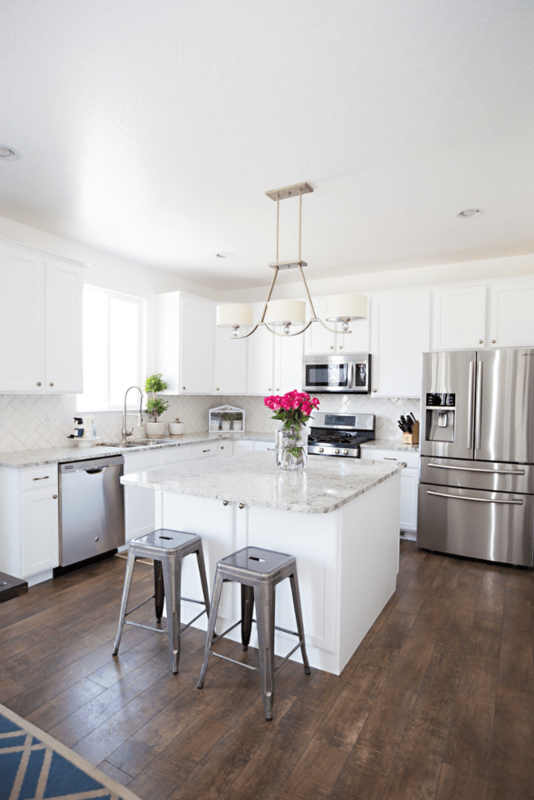 When we were in the process of building and making the selections for our home a year ago, it seemed like everyone (the builders, the sub contractors, the painters, neighbors and their dog) had the same option that it was “too much white” to have a white on white kitchen. To be honest, there were nights I had my doubts. I wondered if I had really chosen the right thing, but I’m SO glad I did because I’m more in love with it now than when we moved in. 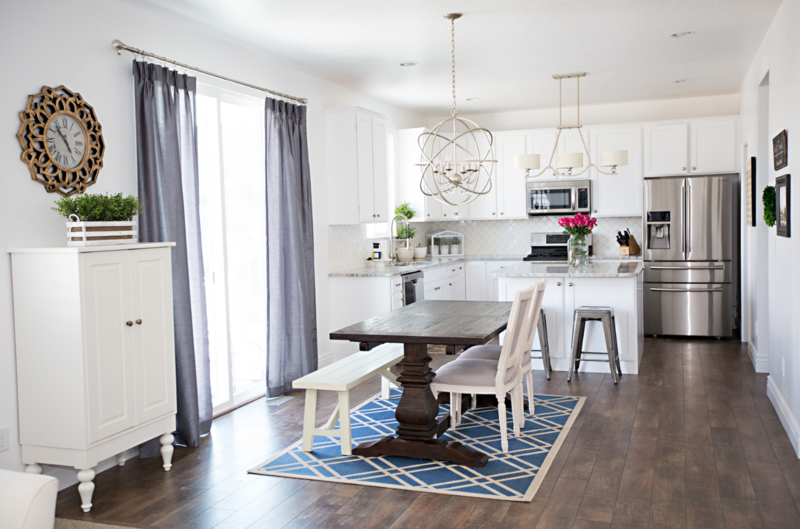 I wanted to point out the three DIYs that I think made the biggest difference in our kitchen. The first and biggest is the gorgeous herringbone backsplash that my husband installed piece, by piece (I’m talking about 15 hours and lots of little cuts). It adds a modern texture and stays true to the feel of this room and my personal style. I also love that very few people in the neighborhood have this backsplash, as everyone is obsessed with subway tile and DIYing it. 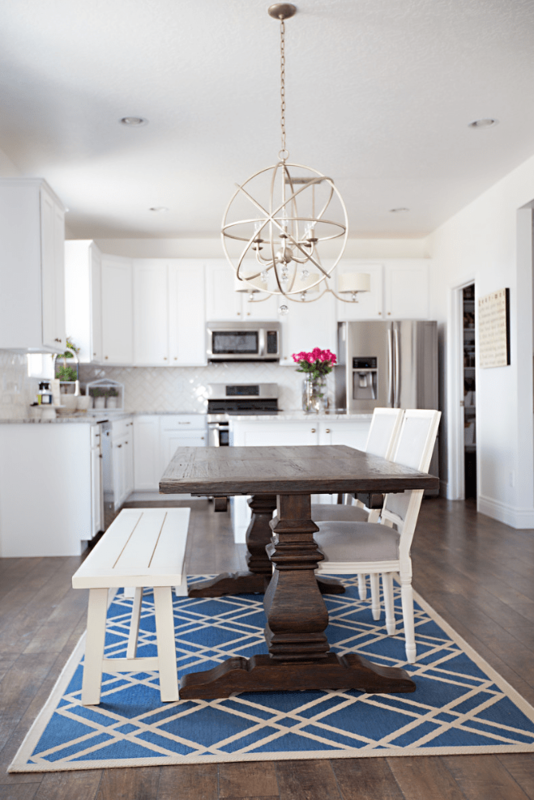 The second upgrade is the light fixture above the island. I found it on Wayfair.com and was so nervous about the color… It was really brassy gold in the picture but I needed something with three bulbs and electrical connection. As you can see it turned out beautifully and it adds so much visually to the white kitchen. I love how the brass plays to the brushed brass hardware. The third thing is the faucet. I actually found a similar one at Lowe’s for our townhouse (four years ago) and they stopped selling it. So sad. Thank goodness for the internet, because I was able to find one I love even more. My friend KariAnn always calls it the “lunch lady” faucet when she comes over, for those of you were thinking it. It reminds me of the faucets we had in culinary school and that makes me happy. 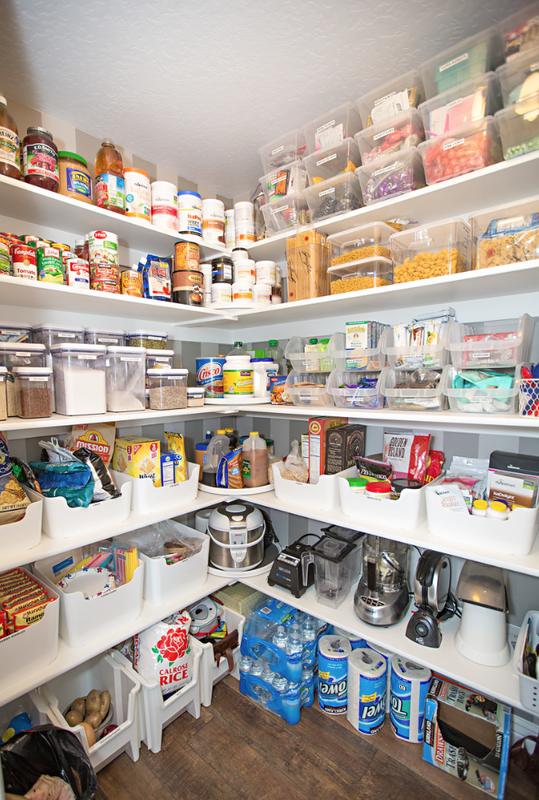 One of the BEST things about my kitchen (besides that enormous island) is the walk in pantry! And yes, I wallpapered in there. Its so nice to have more than enough room to not only hold the essentials, but lots of extra food storage, bulk food items and appliances. The dining room is attached right off the kitchen, and I really like the open concept. It works really well for all of the parties and entertaining we do. This orb chandelier is such a nice compliment to the one in the kitchen and it gives off a lot of light. We also have dimmer switches on almost every light to set the mood if needed. Thank you so much for joining me as we go through my home tour together. I just found your blog & I totally love it!!!!! How sweet of you! Thank you so much! Xo! This is absolutely gorgeous. Nice work!